Thank you for taking the time to visit our website. 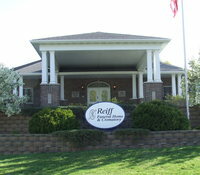 The Reiff Funeral Home and Crematory is the only Independence funeral home which is totally handicapped accessible, and Buchanan County's only Crematory. We are committed to providing our community with the best possible service in their time of need. Our web site will give you information about us and the services we provide. If you have any questions or would like to share suggestions on how we could improve our site, we would appreciate hearing from you. Receive Obituaries as soon as we publish them on your facebook page by simply liking the Reiff Funeral Home face book page.